The Vegas Golden Knights hockey team not only continues to impress the sporting world with its outstanding play, they are doing it in typical Las Vegas-style. A striking projection mapping show uses Christie projection and processing technology coupled with the expertise of Image Engineering to engage the crowd and bring the story of the Golden Knights to life on the ice at T-Mobile Arena. Bringing a professional sports team to Las Vegas—a city known for showmanship and world-class entertainment—is no small feat, and the Vegas Golden Knights have embraced the challenge of playing their home games in the “Entertainment Capital of the World.” One of the top priorities of the team is to create a truly memorable fan experience. The first-year National Hockey League (NHL) club uses 12 Christie WU20K-J projectors, Christie Mystique Install, Christie Pandoras Box and Christie Widget Designer to create the on-ice show. “We wanted to honor the victims, the survivors and the first responders…months of planning turned into a few days of planning. We were listening to the community and seeing what made the most sense,” said Jonny Greco, vice president, events and entertainment, Vegas Golden Knights. 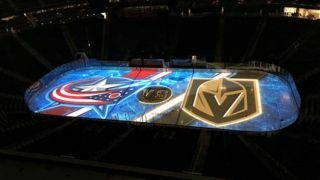 The NHL franchise honored the first responders, victims, and survivors by projection mapping the names of the 58 victims on the ice followed by 58 seconds of silence. “It was celebrating this city and acknowledging what had happened and giving Las Vegas the opportunity to honor and grieve together, and then transition into a few hours of time when hopefully they could have some fun and be in a more positive place,” Greco said. The Golden Knights have been committed to winning fans over since that first game. “Within three hours we have to win them over,” Greco said. It’s quite a concentrated effort. The new franchise knows that expectations are high for one of the NHL’s top teams, and all the elements must work seamlessly to ensure a great fan experience. So for the Golden Knights and Image Engineering, choosing Christie technology was a perfect fit. Image Engineering was brought onboard by the Golden Knights to handle the full game presentation, including AV integration. “We took a lot of care to figure out an installation plan that was going to work for T-Mobile Arena because they do have so many large concerts and one-off shows that come in and out so frequently,” said Ian Bottiglieri, director of project management, Image Engineering. The 12 projectors are in “pods” of two near each face-off circle, each blue line, and center ice, on each side of the arena. Image Engineering then used Christie Mystique to align the projectors, saving both them and the Golden Knights what would normally be between 8 to 10 hours every time the projectors needed realignment after being repositioned for a concert or other event.